In case you're wondering what o kawaii koto お可愛いこと actually means in Japanese, it's a bit complicated. 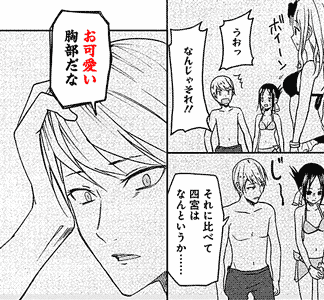 The catch phrase from the manga and anime Kaguya-sama often gets translated as "how cute." That's not what it literally means, but it's pretty much the best translation you can get. If you're out of the loop: o kawaii koto is a phrase often said often imagined to be said by Kaguya in a condescending way. The character imagining her saying it is too proud to allow it to happen. If he did something that gave her the chance to say it, that would hurt his pride immensely, so it must be avoided at all costs. Jump to TL;DR if you aren't really that interested in Japanese. The polite o- お～ prefix doesn't really mean anything. It's just polite. The anime takes place in an elite school, with pretentious, elite students. And Kaguya is an ojousama character. So she speaks in this polite and well-educated-sounding way with meaningless polite affixes and stuff. If there's any meaning behind it, it would be that whatever comes after it belongs to someone else. In Japanese, the rule of thumb of politeness is that you humble yourself and exalt others, so honorific prefixes and suffixes generally don't go on your own stuff, only on stuff of other people's. For example, te 手 means "hand." But if you're referring to someone else's hand, then maybe you want to refer to it respectfully, by adding a completely pointless prefix to it: ote お手, "[your] hand." Similarly, namae 名前 means "name." But often you'll see onamae お名前 as a way to ask for "[your] name." It gets trickier with family words such as oniisan お兄さん, "older brother," because you'd use it to refer to the "older brother" of someone else, except when you're talking to your own family, then it can be your own older brother. The word have kawaii 可愛い, means "cute." It's an i-adjective. And normally there wouldn't be anything to say about it, except that kawaii has a less common second meaning which is actually very relevant in the context of this series: it also means "pitiable." 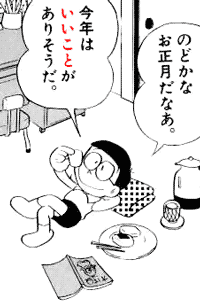 Context: Nobita's father told him to do chores outside, despite his complaints about the heat. So Nobita complains even more. konna hi ni soto e detara, nissha-byou ni naruzo. If [I] leave in a sun like this, [I'll get] a sunstroke! To become so it's a "sun-shot-sickness." To become so it's sunlight-sick. otousan wa, jibun no kodomo ga, kawaikunai no darou ka. To father, [his] own child isn't pitiable, [I wonder]? Doesn't he feel sorry for his own child, who has to go outside under the hot sun? boku wa hontou no ko janai-n-da. I'm not [his] real child. A way to interpret this is that it hurts people's pride to be considered "cute." Because cute is associated small, cutesy animals that aren't scary and you don't take seriously. Or with similarly small children and babies that are immature and you don't take seriously. You don't want to look small and childish. You want to look big and be taken seriously. A cute chest, [I guess]. In this way, kawaii, being both cute and pitiful, becomes condescending word, a word that means the speaker is looking down at you, taking pity on your cute attempts at doing things, specially in this series of overly proud characters. Lastly, we have koto こと. This last word is extremely complicated, because it's a nominalizer and English doesn't have those. Basically, it's a word that means "thing," but that's almost always qualified by some adjective. That is, you normally don't use koto alone the way you'd use "thing" in English. There's always an adjective before koto. In this case, kawaii koto, a "cute thing." Or: "something that is cute." This year it seems good things will happen. This year it seems something good will happen. Joining this all together, the phrase o kawaii koto is just Kaguya noting that there's a "something cute," presumably "something" belonging or related to "you." What this "something" is varies. 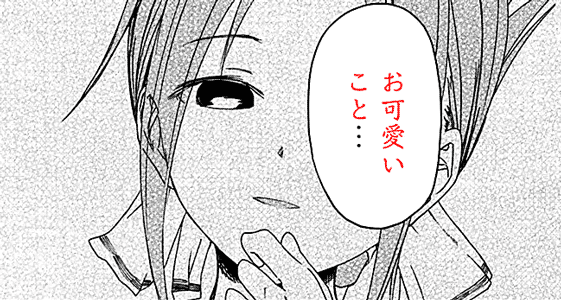 In any case, Kaguya sounds condescending noting it with her rich-girl manner of speaking. In a series with characters so full of pride they can't even confess their feelings, such condescending line would deal some extreme damage. In English, if we tried to note stuff the same way, we'd say, indeed, "how cute," or even, "that's so cute," and so on. Which means it's really the best translation you can get, even though the original phrase had no word that could be translated to "how" in English by itself.